Sandra was born and raised in Rio de Janeiro. And like most "Cariocas" (natives of Rio), she fell in love with nature as a whole at a very young age. Because Rio is surrounded by beautiful tropical beaches, islands, rainforest and mountains, it inspires many people with a deep desire to spend more time in nature. Sandra got the traveling genes from her beloved grandmother, with whom she traveled extensively for a number of years. They traveled across the entire country, mostly by bus, at least eight times. With this early background, it was natural for Sandra to become a Wilderness Guide, and she has been guiding in the Great Outdoors for the past 13 years. Visit her website by clicking here. 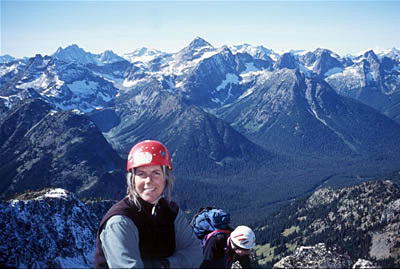 She instructs two to 30 day rock climbing, mountaineering, and backpacking courses in the Colorado Rockies, California Sierras or the North Cascades in Washington State, as well as two- to seven-day outings in the Pecos Mountains around New Mexico or in the Grand Canyon in Arizona. Sandra loves to explore remote alpine climbs that are aesthetic and a mix of rock and ice. And the longer she's in the backcountry, the more she likes it. When she’s not working outdoors, she's planning her next adventure, perhaps to an exotic mountain range or a long bike trip somewhere.